A Special Cellar Tasting in January 2019. For those wishing to go deeper into Linden's Single Vineyard wines, we offer terroir and vintage comparative tastings on Saturdays. 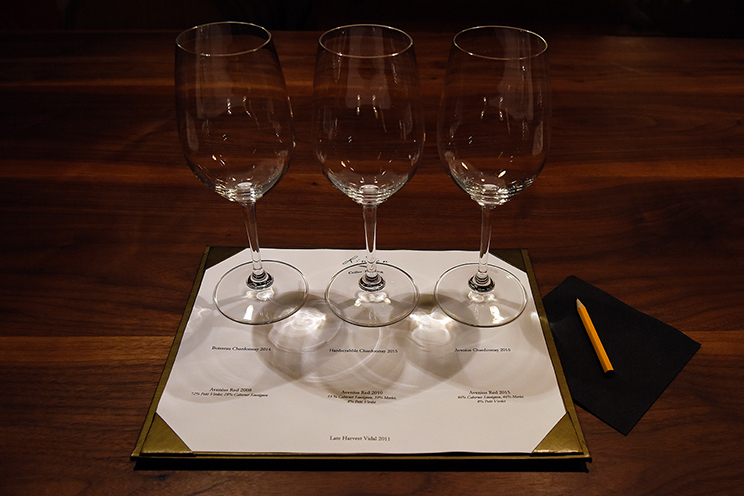 These small, intimate, educational tastings are conducted in the cellar by one of Linden's experienced staff. Comparative tastings change 3-4 times a year. Tastings at 12:00 p.m., 1:00 p.m., 2:00 p.m., and 3:00 p.m.
Space at Linden’s Special Cellar Tastings is limited. Please arrive a few minutes ahead of time. Special Cellar Tastings | Sat Jul 6, 2019 | 12:00 p.m.
Special Cellar Tastings | Sat Jul 6, 2019 | 1:00 p.m.
Special Cellar Tastings | Sat Jul 6, 2019 | 2:00 p.m.
Special Cellar Tastings | Sat Jul 6, 2019 | 3:00 p.m.